Jonathan Edwards (1703-1758) was a formative force in 18th century America; a pastor and a revivalist. Over the span of his ministry, he wrote in his personal notebooks about 500 Notes on Scripture. 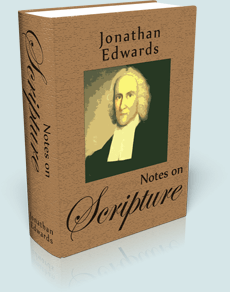 While Edwards' sermons and other letters tended to be long and verbose, most of these Bible notes are quite concise. Many of his other writings often seemed philosophical, but his notes on the Bible emphasize Biblical authority with a strong focus on typology. His most well-known sermon, Sinners in the Hands of an Angry God, is often thought to be filled with "fire and brimstone" and yelled at the top of his lungs. The reality of history is quite different. His preaching and writing were done with the effort to explain an issue to his listeners from point to point in a logical manner. Edwards was a soft-spoken man who valued reason over emotion, and this attitude and approach to teaching is evident throughout his Notes.